Reinforcing mutual agreements and meeting with trade partners in Reunion were the focus of Seychelles Tourism Board’s (STB) Chief Executive, Mrs. Sherin Francis during her official mission to the French department of the Indian Ocean from October 21, 2018 to October 25, 2018. This was the first time that Mrs. Francis called on Reunion counterparts since a representative from STB; Ms. Bernadette Honore, Senior Marketing Executive was positioned there in 2015. Mrs. Francis met with Mr. Jean Marc Grazzini, Air Austral’s assistant general manager of commercial affairs. Air Austral is the only airline company in Reunion with direct connectivity in Seychelles. To date, Air Austral has registered a 7 percent increase in terms of occupancy rate on the Reunion to Seychelles route as compared to the same period in 2017. Mr. Grazzini said that outbound passengers Reunion-Seychelles represents a good share of business for the company. Attributing to the increase in occupancy rate for the airline, Air Austral has reaffirmed to continue operating on the Seychelles route. Following her meeting with Air Austral, Mrs. Francis met with Mr. Gerard Argien, the Director of Reunion Tourisme Federation (FRT), and his team. 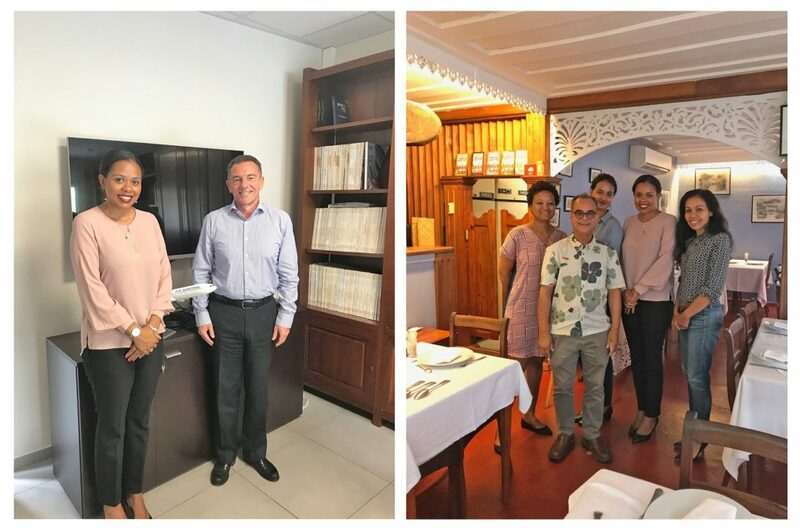 For the past years, STB and FRT have developed a mutual exchange agreement through which four workers from the Seychelles tourism offices have travelled to Reunion, benefitting from professional enrichment. Under the same programme, four staffs of FRT made a trip to tropical Seychelles. Both parties get to share and exchange expertise on different aspects of their duties. One such example is how personnel manage the calls of cruise ships when they call into port. Proving beneficial for both parties, FRT had expressed satisfaction for this exchange programme. On her behalf, Mrs. Francis has given her assurance that STB will continue to support the exchange programme. The tourism board encourages and promotes professional development in other sections and departments within STB and the Tourism Department. “I am looking forward for another year of cooperation with the FRT. We will maintain the exchanges but this time focusing on other areas where our staff could learn from our friends in the region. The exchanges has been very good professional development for the staff, “said Mrs. Francis. Next on her agenda was a meeting with Mr. Stephan Ulliac, the interim chief executive of Ile de la Réunion Tourisme (IRT), the island’s equivalent of STB. Also in attendance was Ms. Linda Futhazar, who oversees the Indian Ocean market at IRT. A mutual agreement exists between the two tourism boards, supporting marketing activities of STB on the market. Mrs. Francis expressed satisfaction for IRT’s support and both parties have come to a consensus to continue working together, mapping out common marketing activities for the future. Seizing the opportunity, Mrs. Francis paid a courtesy call to the Honorary Consul of Seychelles in Reunion, Mr. Jean Claude Pech, where the two discusses STB’s mission in Reunion. The different actions to be implemented to make Seychelles visible on the market were also addressed. The STB Chief Executive Mrs. Francis concluded her visit in Reunion with a meeting with Journalists from Le Quotidien, Exclusif Reunion and RTL to give an update of her mission in Reunion.